Not Jethro Bodine. . .
. . . nor even Jethro Tull . . . The Jethro mentioned in the Old Testament DOR for May 5[, 2014] was the father-in-law of Moses. He is shown in the painting at left, advising Moses on the idea of delegating authority. Previous DORs told of Moses hightailing it out of Egypt after: 1) learning that he was not a prince of Egypt, as he’d been led to believe all his life, 2) learning that he was actually a member of Hebrew people, who were then serving as slaves in Egypt, and 3) after killing an Egyptian overlord who was beating a Hebrew slave. He ended up in Midian, somewhere in the deserts of the Sinai and/or Arabian peninsula, where he met Jethro, a priest of Midian in his own right, and married Jethro’s daughter Zipporah. But by and by (“in the fullness of time”), Moses went back to Egypt after his ten-year exile and eventually – after persuasions including the Ten Plagues – got the Pharoah of Egypt to “let my people go.” (All of which was covered in the Daily Office readings leading up to the one for May 5.) We are now in Exodus 18, with the Children of Israel still wandering in wilderness before getting to The Promised Land, and after the incidents of God providing water-from-the-rock at Massah and/or Meribah, and providing manna and quail to eat. In the reading for Sunday, May 4, Moses – upon his return to the land of Midian – “told his father-in-law all that the Lord had done to Pharaoh and to the Egyptians for Israel’s sake, all the hardship that had beset them on the way, and how the Lord had delivered them.” In other words, Jethro welcomed his son-in-law back to Midian with open arms. Then, in the reading for Monday, May 5 (Exodus 18: 13-27), Jethro watched as Moses tried to settle all the disputes that were coming up as the Children of Israel were still wandering around in the desert wilderness (with tempers no doubt getting extremely short). And Jethro could see that Moses was wearing himself out in the process. He advised Moses to appoint officers – in effect, lower-court judges – to settle the easier cases after teaching them the basic tenets of the law that was even then evolving in the wilderness, either as conditions dictated or as Moses had the law revealed to him by God (or perhaps a combination of both). The passage continues: “Let them sit as judges for the people at all times; let them bring every important case to you, but decide every minor case themselves. So it will be easier for you, and they will bear the burden with you. . . In other words, that’s the basic idea behind the Supreme Court. That it will deal with “hard cases,” leaving minor cases for lower courts. On the other hand, see such recent books as Playing It Safe: How the Supreme Court Sidesteps Hard Cases and Stunts the Development of Law, by Lisa Kloppenberg. The title alludes to the old legal adage that hard cases make bad law. On the other hand, Moses didn’t have a legislature to help him, nor did he have power separated into three different branches of “government;” legislative, executive and judicial, and that of the three the judicial – arguably deciding hard cases – was to be “the least dangerous branch.” See e.g., What is the Proper Role of the Courts (by The Heritage Foundation). All of which raises the question: Is the Bible “frozen in time,” or is it a living breathing document whose story continues “even to this day?” In other words: Is the Bible “grand and eternal” because it provides us with an anchor in a sea of shifting values? Or is the Bible great because of its flexibility and ambiguity, which to some people attests to its ability to “grow and progress” along with society’s evolving sense of justice? Put another way, does the Bible provide a set of “rock-ribbed rules” which must be followed every single day, on pain of suffering hellfire-and-damnation? (As illustrated below.) Or instead does the Bible provide a series of general principles that provide guidance from the past, and which should be adapted to the challenges of the present. . .
That’s a subject for future posts. 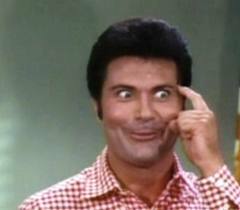 The Jethro Bodine image is courtesy of itsallsatire247.files.wordpress.com/2010/06/jethro.jpg. The “Jethro Tull” image is courtesy of Wikipedia, as is the image of “Jethro advising Moses,” a 1659 painting by Jan van Bronchorst. The Supreme Court image is courtesy of www.mediabistro.com/tvnewser/files … supreme_court_building.jpg. The “burnout” definition was provided by www.merriam-webster.com/dictionary/burnout. This entry was posted in Daily Office readings on May 5, 2014 by dorscribe@aol.com.